Systematic Reviews: How to search? 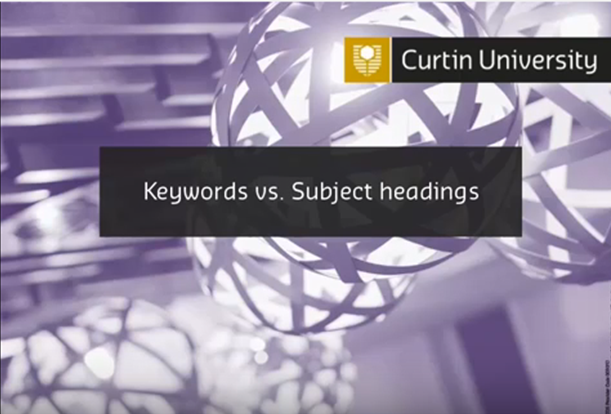 Learn about the advantages (and disadvantages) of searching with keywords and searching with subject headings. When you are conducting your searches, keep track of what you are doing by documenting your search process in enough detail to ensure that it can be reported correctly in the review. It is advisable to use the PRISMA 2009 flow diagram for further documentation of the number of records identified by database searching and through other sources. The flow diagram depicts the flow of information through the different phases of a systematic review. It maps out the number of records identified, included and excluded, and the reasons for exclusions. Instead of filling in a manual form you can now use the PRISMA Diagram Generator to report on the results of a search for a systematic review. A useful reporting tool for qualitative studies is STARLITE. The Library offers hands-on EndNote sessions for both beginners and experienced users. See the Curtin Library workshops calendar to book a place. The overarching objective of a systematic review search for evidence is to identify all the studies (and all the relevant data from the studies) that pertain to the research question. Your search plan will be a brief summary of the topic of the study, a summary of inclusion and exclusion criteria, a list of the appropriate publications, sources and methods that you will use for identifying materials and a list of concepts related to your topic. Your search strategy will put into operation the decisions you have made in your search plan. Begin devising your search strategy by using the PICO for quantitative research and PICo for qualitative research and ensure that the research question has been translated into search concepts. NOTE: It may be useful to work with a librarian who has experience in a wide range of bibliographic databases and electronic information sources to plan your search strategy. The aim of the search strategy is to maximise the retrieval of relevant documents and minimise the retrieval of non-relevant material. It is necessary to strike a balance between achieving comprehensiveness and maintaining relevance when developing a search strategy. Increasing the comprehensiveness (or sensitivity) of a search will reduce its precision and will retrieve more non-relevant articles. Sensitivity is the ability to identify all the relevant studies. Specificity is the ability to exlude irrelevant studies. There is an inverse relationship between sensitivity and specificity i.e. high sensitivity will tend to have low specificity, and this means that a large number of articles retrieved are not relevant to the review question. Inappropriate or indadequate search strategies may fail to identify records that are included in bibliographic databases. It is not necessary to include all of the PICO concepts in the search strategy. It is preferable to search for those concepts that can be clearly defined and translated into search terms. Although a research question may address particular populations, settings or outcomes, these concepts may not be well described in the title or abstract of an article and are often not well indexed with controlled vocabulary terms. Use "Boolean" logic to express relationships between search terms. ·Be aware of spelling variants or abbreviations that may be used by authors. ·Each database has its own unique set of commands and information about these will be on the database help pages. For example many databases use the truncation symbol *while some use $. There comes a point where the rewards of further searching may not be worth the the effort needed to capture additional references. The call to abort further searching depends on the question a review addresses and the resources that are available. A thorough review of some high quality studies is generally preferable to a less discriminate probe for dubious items. What is a custom built filter? Where are these filters available? In PubMed, go to Clinical Queries, enter your search term and your results will be automatically categorised into Clinical Study Categories, Systematic Reviews and Medical Genetics. In Medline (Ovid), use the Additional Limits feature and then choose any of the nine categories in the Clinical Queries limit. << Previous: Where to search?